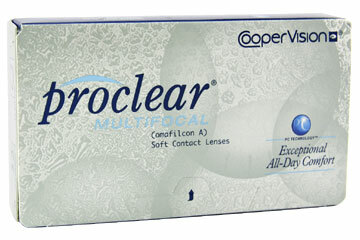 3 lenses per box @ $30.30 per box. Minimum order 4 boxes (six months' supply). The Proclear Multifocal is designed to address two common conditions experienced by those with aging eyes: presbyopia and eye dryness. It combines Coopervisions's Balanced Progressive and PC technologies to give great vision at every distance while staying moist and comfortable, all day long. The PC Technology uses a material containing molecules of phosphorylcholine (PC), a substance found naturally in human cell membranes. These miracle molecules attract and surround themselves with water to keep each lens hydrated.